How much do high schoolers know about economics? The National Assessment of Educational Progress did its first economics test in 2006, and the U.S. Department of Education has now released the results of the 2012 follow-up test in "Economics 2012: National Assessment of Educational Progress at Grade 12." NAEP tests are carried out for a nationally representative sample of high school students. I've never read the actual questions for an NAEP economics test. The report explains that the questions are categorized in three overlapping ways. There are three main content areas: the market economy, the national economy, and the international economy. The questions are also divided into three "cognitive" categories: knowing, applying and reasoning. And the questions are divided into three assessment contexts: individual and household questions on topics related to earning, spending, saving, borrowing, and investing; business questions related to entrepreneurs, workers, producers, and investors; and public policy questions on domestic and international issues. The results are not especially encouraging. 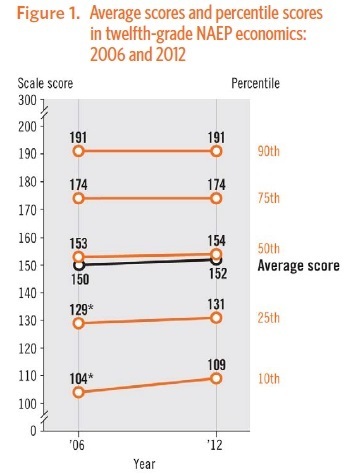 About one-fifth of 12th-graders are "below basic," and the median score is "basic" rather than "proficient." Here's the overall performance in 2006 and 2012. The modest gains from 2006 to 2012 are mainly at the lower end of the test score distribution. However, performance on the economics test follows a pattern that is common across subjects: those with more educated parents tend to perform considerably better. I won't enter here into the disputes over the extent to which these differences reflect family or social influences or differences in school performance. I'll just note that children from families where the parents have lower levels of education are especially in need of a basic understanding of how the economy works at a personal and social level. Also, whatever the cause, education level is clearly one of the ways that families with higher socioeconomic status pass that advantage on to their children. For those who want more detail on high school classes in economics, here's a post from October 2012 on "High School Classes in Economics and Personal Finance." Since Japan's bubble economy burst in the early 1990s, large budget deficits are one policy that the government has used in an attempt to stimulate the moribund economy. Japan's budget deficits have been at least 5% of GDP since the late 1990s, and more like 9-10% of GDP in the last five years. The OECD discusses Japan's budget deficits, and the rest of its economic situation, in the just-published OECD Economic Surveys JAPAN. The "Overview" for the study is available here; the entire report can be read for free via a clunky on-line browser here. In terms of gross government debt, Japan is the world leader. This chart shows the five countries with largest ratios of gross debt/GDP. Japan has been the clear leader since about 2000, although Greece has been making a run at the top spot in the last few years. However, most economists tend to focus on net government debt, which subtracts out debt that the government owes to itself. (For example, in the U.S. context, net debt doesn't count debt held by the Social Security trust fund.) Thus, net debt focuses on how much the government has borrowed in global capital markets. 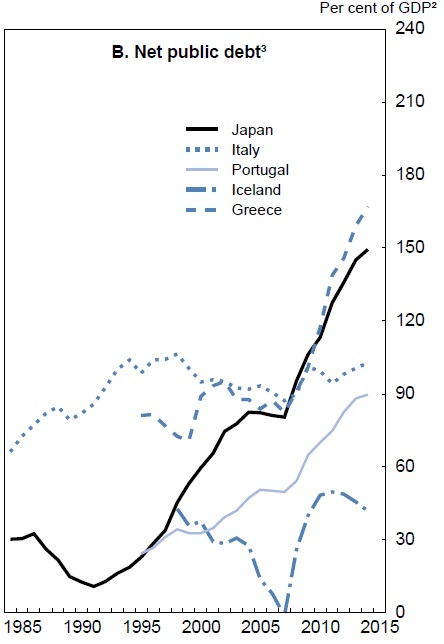 By this measure, Italy was the world debt leader through the 1990s and into the early 2000s, but since then, Japan and Greece have been battling it out for the lead. Japan's enormous debt poses a challenge both to those who advocate larger budget deficits, and for those who do not. For those who advocate larger budget deficits, the challenge is that Japan's enormous rise in debt over about two decades has clearly not been sufficient to restore Japan's economy to robust health. Of course, one can object that a number of other complementary policies are also needed, and the OECD report discusses monetary policy, deregulation, energy policy, education, labor market policies, and more. But if the truly extraordinary increase in Japan's government debt has not been sufficient to stimulate its economy, it suggests that these other policies are of considerable importance. On the other side, for those who advocate smaller deficits, Japan's enormous rise in government debt over two decades, with net debt reaching 150% of GDP, has clearly not led to a financial crisis either. The OECD report straddles the fence here. It warns that Japan's debt is far too high, and calls this the country's "paramount policy challenge." But it also argues that immediate attempts to bring down this debt could keep Japan's economy sluggish, and so argues that a "flexible fiscal policy" is needed. 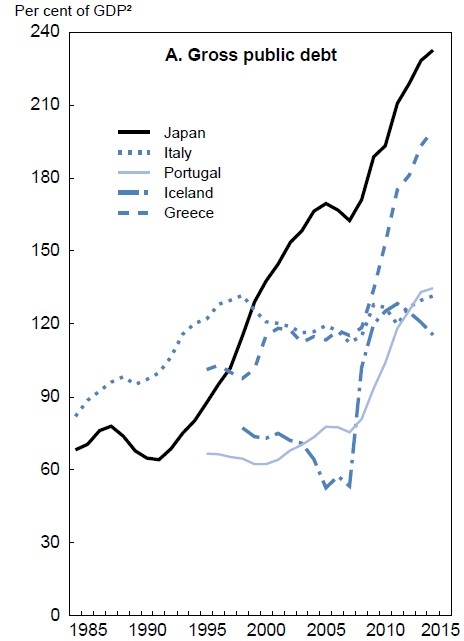 Here is the OECD report, dancing: "The public debt ratio has risen steadily for two decades, to over 200% of GDP. Strong and protracted consolidation is therefore necessary to restore fiscal sustainability, which is Japan's paramount policy challenge. ... Stopping and reversing the rise in the debt-to-GDP ratio is crucial. Stabilising the public debt ratio by 2020 may require, depending on the evolution of GDP and interest rates, an improvement of the primary fiscal balance from a deficit of 9% of GDP in 2012 to a surplus as high as 4% by 2020. Controlling expenditures, particularly for social security in the face of rapid population ageing, is key. Substantial tax increases will be needed as well, although this will also have a negative impact on growth. Given the size and duration of fiscal consolidation, Japan faces the risk of a marked rise in interest rates, threatening a banking system that is highly exposed to Japanese government debt." Contemplate that for a moment: the recommendation is for moving from a deficit of 9% of GDP in 2012 to a surplus of 4% of GDP by 2020--that is, a swing in the government budget balance position of 13% of GDP in just 8 years. The U.S. debt situation differs from that of Japan in two ways: 1) the U.S. debt/GDP ratio is far smaller; and 2) domestic savings in Japan are high enough that the country can finance its government borrowing from domestic sources. In contrast, the U.S. government has depended for years on inflows of foreign investment capital to finance its debts. Thus, Japan's government needs to be concerned that its domestic savers will start looking elsewhere for higher rates of return, while the U.S. government needs to be concerned as to whether international investors will continue to put their money in Treasury bonds. I remember when I was a high school debater back in the 1970s, and the oil price shocks led to arguments over the prospects for solar, wind, geothermal, and other kinds of power. Here we are more than three decades later, and carbon-based fuels continue to rule. The International Energy Administration surveys the global situation in "Tracking Clean Energy Progress 2013." Here is the Energy Sector Carbon Intensity Index. 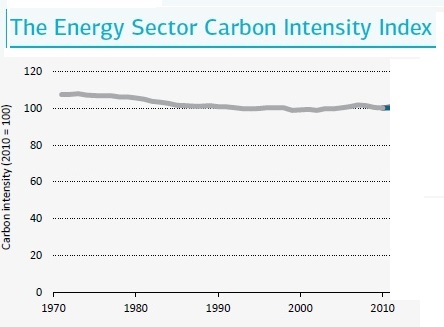 As the IEA report explains: "The IEA Energy Sector Carbon Intensity Index (ESCII) tracks how many tonnes of CO2 are emitted for each unit of energy supplied. It shows that the global aggregate impact of all changes in supply technologies since 1970 has been minimal. Responses to the oil shocks of the 1970s made the energy supply 6% cleaner from 1971 to 1990. Since 1990, however, the ESCII has remained essentially static, changing by less than 1% ..."
Greater efficiency in energy consumption. "Industrial energy consumption could be reduced by around 20% in the medium to long term by using best available technologies (BAT)." Nearly half of global energy consumption is for either heating or cooling, two activities where efficiency gains are often possible. The IEA calculates that nearly half of its desired gains in reduction of carbon emissions by 2020 can be achieved by greater energy efficiency. significantly reduce coal consumption and lower emissions." TThus, one step is to make burning coal, where that is going to happen, more efficient. In addition, natural gas can play a substantial role to lower emissions of carbon and various pollutants by offering a practical alternative to coal-fired electricity generation. capture and storage (CCS) deployment." The report notes: "While 13 large-scale carbon capture and storage (CCS) demonstration projects are in operation or under construction, progress is far too slow to achieve the widespread commercial deployment envisioned ..."
Smarter electrical grids. Smart grids can operate in a number of ways. They can allow charging higher prices at times of peak loads, to encourage shifting demand. They can be programmed so that heating or cooling can be automatically adjusted when demand is especially high. They are going to be a necessity if the electrical grid is to be based on a wider range of energy sources, some of which may vary with sun and wind. 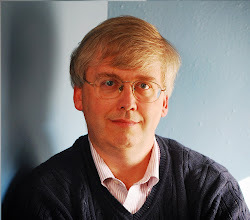 Those who express concern over consequences of high energy use--from conventional pollutants to the risks of climate change to effects of price fluctuations and geopolitical issues--are sometimes a little too quick to offer a policy prescription that involves waving a magic wand of R&D spending over solar or wind or biofuels. I'd be delighted if that magic wand actually produced a commercially viable and vast source of clean energy, and maybe it will. But in the meantime, sensible policy-makers need to focus on cobbling together a range of less glamorous but perhaps more practical alternatives. If skill level is so important in the U.S. economy, then why are the share of low-skilled jobs in labor force rising? The answer lies with the phenomenon of job "polarization," a decades-long pattern in which the share of of medium-skill jobs is falling, while the share of both high-skill and low-skill jobs is rising. Didem Tüzemen and Jonathan Willis examine some aspects of this phenomenon in "The Vanishing Middle:Job Polarization and Workers’ Response to the Decline in Middle-Skill Jobs," published in the First Quarter 2013 issue of the Economic Review from the Federal Reserve Bank of Kansas City. For starters, here is a figure showing the share of jobs in high skill, medium skill, and low skill occupations. Clearly, the diminution in middle-skill jobs is a fairly steady long-term trend (although the authors present some evidence that it happens a little more quickly during recessions). formal education beyond high school. They work in occupations thatare physically demanding and cannot be automated. Many of these occupations are service oriented, such as food preparation, cleaning, and security and protective services." In the middle ground, "middle-skill occupations include sales, office and administrative support, production, construction, extraction, installation, maintenance and repair, transportation, and material moving." They write: "Workers in middle-skill occupations typically perform routine tasks that are procedural and rule-based. Therefore, these occupations are classified as“routine” occupations. The tasks performed in many of these occupations have become automated by computers and machines ... In contrast, tasks performedin high- and low-skill occupations cannot be automated, making them “non-routine” occupations. Thus, the technical change that boosted the demand for high-skill jobs also contributed to the fall in demand for middle-skill jobs, as computers and machines became cost-effective substitutes for these workers.International trade and the weakening of unions have also contributed to the decline in middle-skill occupations." Of course, the polarized labor market also means a more polarized income distribution. Intriguingly, they offer a chart of median wages that suggests that it isn't the pay of those at different skill levels that has diverged, but rather the number of people working at jobs at these skill levels. "Given the sharp decline in manufacturing employment in the past three decades, this sector might appear to have been the main driver of job polarization. However, empirical evidence reveals that job polarization has been primarily due to shifts in the skill-composition of jobs within sectors as opposed to the shifts in employment between sectors in the economy. All sectors have experienced declines in the within-sector share of workers in middle-skill jobs. ... This distinction is important for labor market policy as it suggests that the impact of job polarization has been widespread across the economy rather than concentrated in a single sector, such as manufacturing. ..."
"Job polarization has affected male and female workers differently. In response to the decline in the employment share of middle-skill occupations, employment of women has skewed toward high-skill occupations, while employment of men has shifted proportionally toward low- and high-skill occupations. ..."
"From 1983 to 2012, the employment share of workers age 55 and older in high-skill occupations increased. This shift was related to the aging of the labor force and the delay in retirement of workers in higest demand – those with higher levels of education. In contrast, among workers ages 16 to 24 the largest increase was in the employment share of workers in low-skill occupations. Compared to the 1980s, younger people have been staying in school longer and postponing their entry into the labor force. These developments have shifted the composition of workers in the labor force and suggest that the retirement of the baby boom workers over the next decade may reduce the supply of highly-skilled workers." Does Banning Texts While Driving Work?